Beautifully appointed beachfront, 24- hour guard gated, ocean view condo boasts granite counter tops, stone flooring, fully equipped gourmet kitchen, indoor washer/dryer, safe, A/C throughout, 2 flat screen tv's, free wi-fi and ceiling fans. Other amenities include gourmet BBQ/Grill, ocean view fitness center, kayaks (with life vests) , boogie boards and stand up Paddle Boards - all FREE for Condo guests! The grounds are tropically landscaped and you can also enjoy several species of birds and Iguanas. Food and beverages are available poolside. This Condominium is located on the South end of the exclusive Playa Flamingo. The Palms at Playa Flamingo is THE ONLY condominium complex ON the REAL Playa Flamingo. This complex underwent a three year long COMPLETE makeover, completed in 2009, that has made it arguably the most prestigious resort style condominium complex in all of Guanacaste, Costa Rica. Enjoy Ocean views from the entire downstairs and the master bedroom. It is less than fifty steps to the white sand beach. 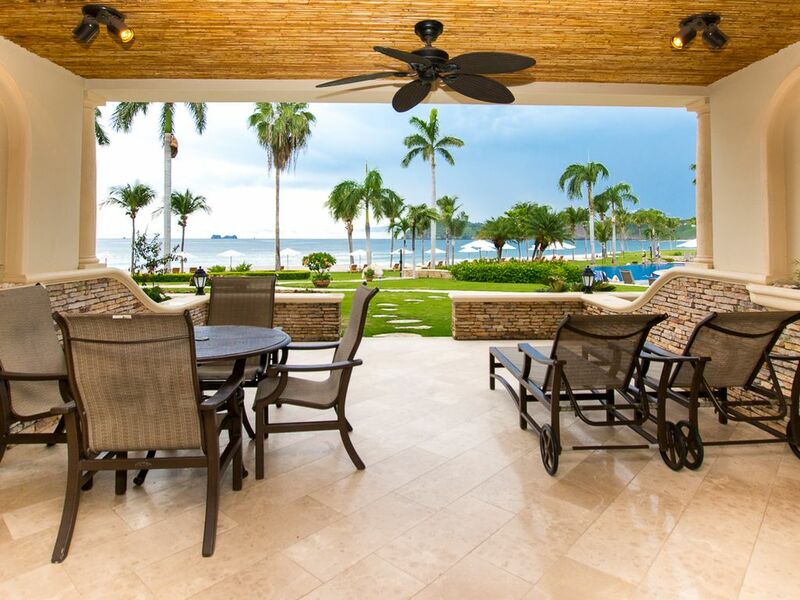 Enjoy the sound of crashing surf and Howler Monkeys as you relax inside this upscale, like-new condo. The Palms has twenty four hour guard gated privacy and two pools with a creek connecting them. The Palms has a fitness center with an assortment of cardio and weight lifting equipment and has floor to ceiling windows that directly overlook the beach. There is a common barbecue area that boasts brand new state of the art Viking grills situated under an attractive Palapa roof. We offer a gorgeous infinity pool, a circle pool, and condo, and/or beach-side food and beverage service - whichever you prefer. We also have a chef available that can prepare a custom gourmet meal in the condo. The business center, located at The Palms entrance, has desktop computers with high speed Internet. In addition there is a fax/scanner/printer/copier in the business center. There is a web cam located on each computer as well. There is an international Vonage line located in the business center that all guests are welcome to use to make free international calls. There is also wireless and local phone in the condo. The Palms is arguably one of the most sought after vacations spots in all of Guanacaste. Inquire now to learn how we can make your vacation dreams come true. We live in Orange County California and have been going to Costa Rica for 20+ years. We finally purchased our own place in May of 2004. We love it down there and decided to share our property for others to enjoy. In 20+ years of traveling the beautiful country of Costa Rica, we decided on Playa Flamingo because of its friendly people, white sand beach and exclusive ambiance. Our property is on the south end of the exclusive Playa Flamingo. There is only one condo complex on the entire Playa Flamingo and ours is it. The south end of the beach has no commercial enterprise thus is quiet and uncrowded. Truly beachfront. Less than fifty steps to the white sand beach. One line for local calls. Large capacity washer and dryer in large closet off of kitchen. Free, air-conditioned State of the Art Fitness Center with ocean view located on the grounds. Free, High speed wireless signal throughout the unit with great connection all the way to the pool! Large flat screen TV with sound bar with Bluetooth capable connection. Play your favorite music from your Bluetooth capable device. Google Chrome cast media streaming device. Dining in condo, on deck, by pool or on beach available. Flat Screen TV in Master Bedroom. Flat screen TV in Living Room. Cable TV with English stations such as FOX news, CNN and ESPN. Several English movie channels. Wireless Bluetooth sound bar system with surround sound. Connect your Bluetooth capable device for music. Games and DVD movies are offered in the condo and at the main Palms office. Free use of videos, games and books are available at The Palms main office. Large lawn area fronted by the sand. Play Frisbee soccer and more. Large, ocean view balcony off of master bedroom and small deck off of guest bedroom. Large lower and upper decks with beautiful marble flooring and new patio furniture. Free paddle boards, boogie boards are available for all guests. Can’t say enough great things about this property and the location. John and Wendy are fantastic people and extremely helpful. The unit itself was very clean and spacious, with gorgeous views. The staff at the Palms were over the top friendly and accommodating, always willing to help or answer questions. Once again, I can’t say enough great things about John and Wendy, their place and the Palms as a whole. It was a great time and one of the most relaxing trips I’ve ever been on. My wife and children loved our time there and look forward to going back. Right on the beach, high class condo......hated to say goodbye! The condo has it all. We will be back!!! Beautiful unit with great location. The furnishings and decorations were very nice with great amenities in the complex. We'll definitely be back! We stayed with our family (3 kids: 16, 13 & 11) for 1 week at the end of March. Our son slept on the pull out sofa and our girls took the bedroom upstairs. There was plenty of room for us. The villa was wonderful. The service was top notch. The beach was perfect. We loved getting Costa Rica and The Palms. I highly recommend! We have been to multiple places in Costa Rica, but nothing really compares to the Palms or Flamingo Beach. The condos are absolutely beautiful and spacious. Each one has a remarkable view (#6 is perfectly positioned for a view of the pool and the beach). Our kids (12 and 9) surprisingly never wanted to leave the condos for the typical touring of monkeys, zip-lines and crocodiles. They were content playing in the waves, the pool, and drinking milkshakes at the pool bar. To my surprise, the Palms not only provided drink and food service, but it was amazing! The service was top notch with the staff being extremely accommodating and friendly. This is the type of service we expect when we stay at the Ritz Carlton, or other high-end hotels. We also purchased the private dinner for our patio. It was a fantastic experience and I would recommend it. The bottom line is that we will probably never stay anywhere in Costa Rica, but at the Palms. Anything else may be a let down for us. Just returned home from an excellent vacation! Don't hesitate to rent this place!! This villa was perfect for our family of 4. The new pull out bed in the living room was a very nice option, my kids weren't very excited about having to possibly share a bed. It worked out great- there were plenty of sheets/blankets to make it very comfy! Villa 6 is in the perfect location on the immaculate property with an outstanding view of the entire beach and amazing sunsets directly in front of you in the evenings. The service at The Palms was also excellent -top notch! Looking forward to returning!